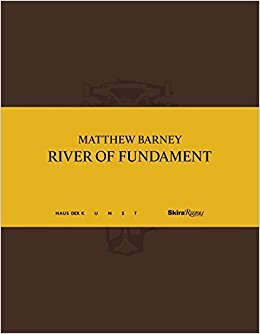 Conceived and articulated as a site-specific opera, River of Fundament takes its inspiration from Norman Mailer's novel Ancient Evenings, which chronicles the protagonist's soul's journey through death and reincarnation, according to Egyptian mythology. This multipart body of work continues the artist's practice of crafting rich, complex worlds in which mythology (historical and personal), literary narrative, and investigations of the body merge and mutate. Accompanying the major exhibition at the Haus der Kunst as well as the debut of the artist's film, this catalogue - organized narratively according to the structure of the film - will feature large-scale sculpture (made from industrial materials such as iron, bronze, lead and copper), drawings, film and performance stills, storyboards, and the original scores by Barney's longtime collaborating composer Jonathan Bepler. Contributing critical writings to the volume are Director of the Haus der Kunst and curator of the exhibition Okwui Enwezor, literary theorist Homi K. Bhaba, and writer and critic Hilton Als. The book will also feature inserted playbills for the three performances related to the series. Italy, 2014, 23 x 30cm, illustrated, 312pp, Hardback.